UPDATE: On February 24, 2017 at noon, Mr. Quershi was located at MacNeal Hospital. He is now safe and with his family. Thank you to all for getting the message out and helping to locate him. February 23, 2017. Downers Grove Police are trying to locate a missing person who suffers from Alzheimer's disease. 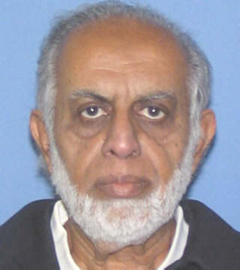 This person, who cannot speak, was last seen today at Gloria Dei Lutheran Church, 4501 Main Street, at 11:00 a.m.
His name is Shamin Quershi, he's 74 years old, 5'08',' 180 pounds, with brown eyes, gray hair and a gray beard. He was wearing a golf shirt, dark business jacket and dark pants. If you have any information please contact the Police Department at 630 434-5600.